From a sticky piece of paper posted to a wall to the magnificent million dollar commercial, marketing is presented to us everywhere and in so many ways. The big companies used to tell us what we wanted and provided us with a choice of product. But things have changed. The opinion of the customer was always important but now... It is a MUST! With social media integration, companies are able to gather the most interesting information from their clients, customers and friends. Now the consumer has the voice and is able to tell the companies exactly what they want, sometimes in a direct way - other times in a sneaky way. Benchmark Email wants to share the best methods and techniques of social media: How to use it, understand it and how it can benefit you and your business. 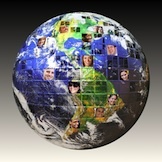 April 8, 2011 we will be hosting a 30 minute Benchmark Email Webinar focused exclusively on social media. Just follow the link to sign up - it’s totally free and I welcome you to ask questions and participate in the experience. I look forward to seeing you there and invite you to take this opportunity to expand your email marketing with social media and online networking.